On Tuesday, April 9, 2019, at approximately 6:20 p.m., the Calvert County Control Center broadcasted a lookout for a blue Ford work van with Virginia tags that was all over the roadway. The van was being followed by a citizen who was providing updates of the vehicle’s location to the control center. Deputies from the Calvert County Sheriff’s Office located the vehicle in the area of Route 2 and Dalrymple Road and conducted a traffic stop on the vehicle. The driver of the vehicle was later identified as Dodanim Ninrod Aguirre, 32, of Clinton. Police attempted to make contact with Aguirre who immediately rolled the windows up. Police asked Aguirre to roll his window down numerous times and Aguirre refused. They also asked Aguirre for his license and registration numerous times and he refused. One officer used a baton and broke the driver’s door window in order to extract Aguirre from the vehicle. Aguirre was extracted from the vehicle, taken down to the ground, and handcuffed. Aguirre did not have a license on his person and refused to tell police who he was. A probable cause search of the vehicle yielded a black .40 caliber HK handgun with a magazine that contained 12 rounds. The gun was located in a holster in the area of the center console. EMS personnel arrived on scene and treated Aguirre for superficial lacerations from the broken glass. Aguirre was offered a preliminary breath test but refused. 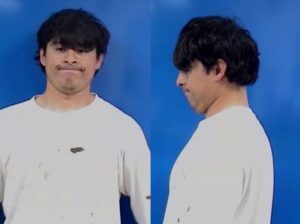 Police were able to obtain Aguirre’s information by running the license plate on the van and obtained a Maryland MVA photo, which they confirmed was Aguirre. The gun was run through MGUN and is registered to Aguirre. Aguirre does not have a permit to carry a handgun in Maryland. When police asked why he had a gun Aguirre stated something to the effect of that cops always shoot people these days. Aguirre was released a few hours later after posting an unsecured personal bond in the amount of $5,000. Aguirre is due in Calvert District Court on May 10, 2019. This entry was posted on April 11, 2019 at 5:14 pm and is filed under All News, Calvert News, County, Law Enforcement, Prince George's News, Top News, z 600X120 Top Ad Bottom, z Police Ad Top. You can follow any responses to this entry through the RSS 2.0 feed. AND YOU REALLY THINK HE WILL SHOW UP FOR TRIAL? Judges need to go. Awe, he had nothing to worry about, his white privilege protected him. white priviledge in Clinton lol, yeah okay, guess we must of missed out on that white priviledge offered there these last few decades then..
either-way he isn’t technically white but, do love how you guys like to group all colors into that white category when it doesn’t fit your narrative, makes it easier for you all to spew your blinded beliefs i suppose..
A- No such thing as white privilege (fake democrat talking point). B- He’s not Caucasian, he’s Hispanic. C- He gets his hair cut at Lighthouse for the Blind. E- His family might have snuck across the border illegally and simply been released in the United States, given free healthcare, welfare and driver’s licenses because of their brown privilege. I was going to respond but you hit all my talking points perfectly. On Point, you’re on point. Go ahead and respond, the truth can never be said too much or enough. The only way you put out the fire of lies is with a river of the truth. The statement assumes that ALL whites have privilege, which is bullshi# made up by democrats to convince minorities that they can’t compete and need them, (the govt.) as a parent to take care of them. To believe there is white privilege, you would have to not only be ignorant but racist, and have a victim mentality. Take a trip to Appalachia and see the poorest people in the United States. They don’t have the luxuries that the ghettos have. There IS RICH PRIVILEGE, and most of those slots are filled by democrats of all races. If he had this supposed “white privilege”, he never would have been arrested. Idiot. Look out! He’s about to barf! Another drunk idiot with a bonus. Go back to whatever craphole you came from if our police scare you so much. Drunk douchebag. Nimrod is right. They say he seems drunk, and he replies: “I never confessed to it!” What an IDIOT. WHAT A LOSER! Good job officers. Keep up the good work. Great job officers, bad job district court commissioners and judges. Just catch and release. If there is ever a hispanic version of the 3 Stoodges, he has the part of Moe nailed. Sure hope he wasn’t inconvenienced. Bet I know who will fund his attorney. 32 years old and living off the system’s loop holes. A true santuary citizen, a parasite sucking up taxpayer dividends. What a loser and actual definition of a POS. You “thu” not Through, but thu dawg!!! !